Soper used live music and theater to illustrate the works of famous philosophers. Singer and composer Kate Soper, SoA ’11, floated onstage in an evening gown, took her place behind a screen, and paused. After a moment of thought, she emerged from behind the screen, assumed center stage, and began to sing. The words of her song probably sounded familiar to Columbia students and anyone else acquainted with the names engraved on Butler Library’s façade. Soper brought the ideas of influential western thinkers—including Aristotle, Sophocles, and Plato—to life at Miller Theatre during her performance on Saturday evening. 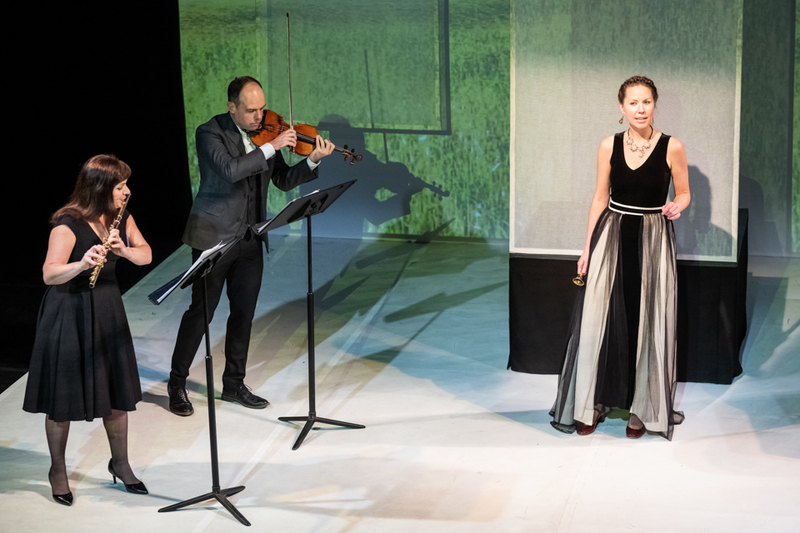 Part theater and part chamber music concert, Ipsa Dixit featured Soper wrestling with philosophical ideas, accompanied by New York-based chamber music ensemble Wet Ink. Soper’s Pulitzer Prize-nominated composition was presented at Miller Theatre as part of its flagship event series, Composer Portraits, supported by the National Endowment for the Arts. Throughout the 90-minute performance, Soper used live music and theater to illustrate the philosophers’ musings, ranging from art to metaphysics. In a memorable scene, Soper and percussionist Ian Antonio acted out the Crito, a dialogue written by Plato. As they recited Plato’s text, both performers played the xylophone. Not only did the xylophone underscore the conversation, but music also occasionally replaced the dialogue, illustrating how music can express complex ideas in an entertaining way. While most college students are familiar with the fundamentals of rhetoric, Ipsa Dixit unlocked another dimension of rhetoric by emphasizing the persuasive power of music. While Soper recited text by Aristotle, other members of Wet Ink demonstrated how music can be used to create wordless analogies and appeal to the listener’s emotions. Soper often began a sentence, and Wet Ink continued it, filling each pause in her speech with a seamless musical response. This season, Wet Ink is celebrating 20 years of making music together, and its expertise was evident: The members played together as effortlessly as two old friends engaged in conversation. Soper’s crystalline soprano voice—accompanied by Josh Modney’s violin, Erin Lesser’s flute, and Antonio’s percussion—often filled the theater, but moments of silence were equally resonant. After Soper presented Robert Duncan and Plato’s thoughts on metaphysics, she stood silently in front of a mesmerizing galactic background. The colors of the projected scene washed over her expressive face and her evening gown while the audience ruminated on Soper’s words—or, rather, Duncan’s and Plato’s words, adapted and voiced with conviction by Soper. It’s worth noting that Soper took ownership of these classic texts by male authors, weaving them into an epic original composition for the female voice. A common criticism of the Core is the underrepresentation of works by women and minority groups. Ipsa Dixit, then, is a refreshing take on some of the Core texts that subversively celebrate the female perspective. In retrospect, Soper’s emergence from behind a screen at the start of the performance was a powerful way to set the tone for this show. The image of Soper taking command of the stage fits the show’s title, which translates to “She, herself, said it.” By the end of the show, the audience appreciated that Aristotle said it, Sophocles said it, Plato said it—and yes, Soper said it.